The investigation into the dwarf planet Ceres' mysterious bright spots has taken an intriguing new twist. The famous bright spots at the bottom of Ceres' Occator crater appear to be sublimating material into space, creating a localized atmosphere within the walls of the 57-mile-wide (92 kilometers) hole in the ground, new observations by NASA's Dawn spacecraft suggest. "This is our major mystery," Russell said, referring to the nature of the bright spots. During the talk, Russell revealed some other discoveries by Dawn. For example, the probe's observations show that Ceres is slighly smaller than researchers had thought — about 598 miles (962 km) in diameter, rather than 607 miles (974 km). That means the dwarf planet is about 4 percent denser than previously thought, Russell said. Dawn has also spotted numerous long, linear features whose cause is unknown, as well as one big mountain that mission team members have dubbed "The Pyramid." This massif, which is about 3 miles (5 km) tall and 19 miles (30 km) wide, features a flat top and strangely streaked flanks, Russell said. "It's got white sides on much of the surface," he said. "It just looks like the material is cascading down from above." 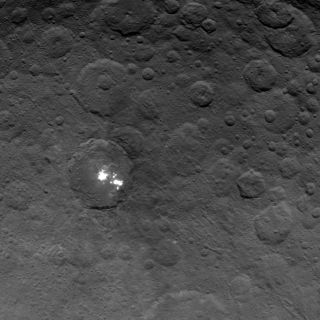 A 3-mile-high (5 kilometers) mountain dubbed "The Pyramid" juts from Ceres' limb in this photo by NASA's Dawn spacecraft. Overall, Dawn's observations are showing Ceres to be a relatively active world rather than an inert chunk of rock and ice, mission team members say. "Some areas are less densely cratered than others, suggesting that there are geological processes that erase the craters," Dawn chief engineer and mission director Marc Rayman, of NASA's Jet Propulsion Laboratory in Pasadena, California, wrote in a blog post last month. "Indeed, some regions look as if something has flowed over them, as if perhaps there was mud or slush on the surface." Scientists know from Ceres' density that the dwarf planet contains lots of water, the majority of which is almost certainly in the form of ice. But some researchers think liquid water may exist in places beneath Ceres' surface — intriguing because here on Earth, life thrives pretty much wherever liquid water pools or flows. "It is possible that the water systems associated with Ceres may harbor life, and could be conducive to life more than some of the outer solar system bodies," Russell said. "So I would say, we really do need to spend some time in probing the surface of Ceres and checking out its astrobiological implications." The $466 million Dawn mission launched in September 2007, tasked with studying the two largest objects in the asteroid belt — Ceres and the 330-mile-wide (530 km) Vesta. Dawn orbited Vesta from July 2011 through September 2012, and the spacecraft arrived at Ceres this past March. The probe will get closer still in January. Dawn's fourth and final science orbit lies at an altitude of just 235 miles (375 km). The probe will continue studying Ceres from that orbit until the end of its mission, in June 2016.